A team of researchers from Worcester Polytechnic Institute (WPI) have presented a paper describing a novel light-activated phenomenon that has the potential to become the foundation for applications as diverse as microscopic robotic grippers, optical telecommunications systems, and more efficient solar cells. “This is a new area of science,” said Balaji Panchapakesan, associate professor of mechanical engineering at WPI and key author of a paper focusing on the new material published in Scientific Reports, which is an open access journal from the publishers of Nature. Very few materials are able to convert photons directly into mechanical motion. In this paper, we present the first semiconductor nanocomposite material known to do so. It is a fascinating material that is also distinguished by its high strength and its enhanced optical absorption when placed under mechanical stress. Tiny grippers and actuators made with this material could be used on Mars rovers to capture fine dust particles. 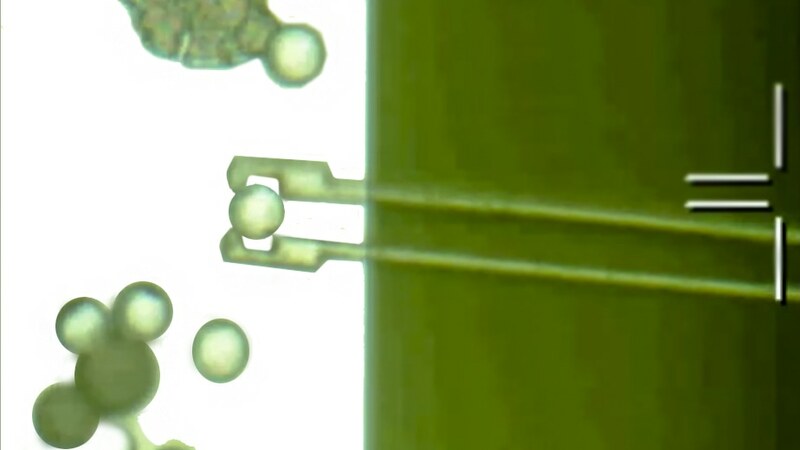 They could travel through the bloodstream on tiny robots to capture cancer cells or take minute tissue samples. The material could be used to make micro-actuators for rotating mirrors in optical telecommunications systems; they would operate strictly with light, and would require no other power source. The Scientific Report paper titled “Chromatic Mechanical Response in 2-D Layered Transition Metal Dichalcogenide (TMDs)-based Nanocomposites” characterizes molybdenum disulfide based on the arrangement of electrons and on the way the electrons move within its atoms. Electrons existing in semiconductors can only move from a group of outer orbitals known as the valence band to another group of orbitals called the conduction band when sufficiently excited by an energy source, such as the photons in a beam of light or an electromagnetic field. The electrons cross the band gap and develop a flow of electricity, which is the principal that highlights the possibility of producing solar cells and computer chips. Nanocomposite Ceramics - What are Nanocomposite Ceramics? Positively charged voids called holes are left behind when the negatively-charged electrons move between orbitals. An exciton refers to pair of an electron hole and a bound electron. Panchapakesan's team included graduate students Vahid Rahneshin and Farhad Khosravi and also colleagues at the University of Louisville and the University of Warsaw Pasteura. The team discovered that the atomic orbitals of the molybdenum and sulfur atoms present in molybdenum disulfide are positioned a unique way, which allows excitons within the conduction band to work together with p-orbitals of the sulfur atoms. This “exciton resonance” contributes to the powerful sigma bonds that supply excellent strength to the two dimensional array of atoms in molybdenum sulfide. This strength also plays a vital role in developing a unique effect capable of generating heat within the material. This heat gives rise to the chromatic (light-induced) mechanical response of the material. Panchapakesan’s team took advantage of the later phenomenon, by developing thin films made up of only one to three layers of molybdenum disulfide covered in rubber-like polymer layers. These nanocomposites were then exposed to different wavelengths of light and this helped the team to discover that heat generated due to the exciton resonance allowed the polymer to expand and contract, based on the wavelength of the light used. In earlier work, the team harnessed this photo-mechanical response by fabricating extremely small grippers that both open and close according to light pulses. These grippers are capable of capturing plastic beads that resemble the size of a single human cell. Panchapakesan and his team further discovered another novel behavior of the molybdenum disulfide composite that makes room for a wide variety of applications. The team used strain engineering to stretch the material and then identified that mechanical stresses increased the material’s ability to absorb light. This is something that cannot be done with conventional thin-film semiconductors, because when you stretch them, they will prematurely break. But with its unique material strength, molybdenum disulfide can be stretched. And its increased optical absorption under strain makes it a good candidate for more efficient solar cells, photodetectors, and detectors for thermal and infrared cameras. The exciton resonance, photomechanical response, and increased optical absorption under strain make this an extraordinary material and an intriguing subject for further investigation. The National Science Foundation (CMMI: 1463869) supported Panchapakesan's research.